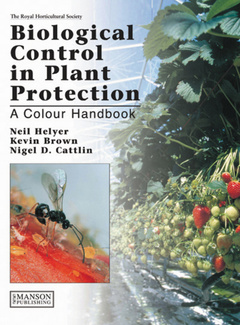 Biological Control in Plant Protection Helyer Neil, Cattlin Nigel D., Brown Kevin C.
Authors: Helyer Neil, Cattlin Nigel D., Brown Kevin C.
Add to cart the livre of Helyer Neil, Cattlin Nigel D., Brown Kevin C.
This color handbook, now updated for a second edition, is designed to help the reader anticipate and recognize specific problems of pest management and then resolve them using the natural enemies of pests—insects, mites and diseases. The authors have added descriptions of 11 new biological control agents and have revised the text throughout. The second edition also includes a new chapter on the practice and application of biological control. The authors first describe the impact of predator-prey relationships on host plant species in arable, orchard and protected environments. The main sections of the book include profiles of pests, beneficial species and entomopathogens, featuring a tabular pest identification guide and concise text dealing with species characteristics, life cycle, damage symptoms, plant/pest associations and their influence on growing practices. The text is illustrated throughout with color photographs of the highest quality. The handbook is a valuable reference guide for professional, academic and lay readers: growers, farmers, consultants, scientists, and students. Preface, Section 1: Plant environments, Arable environments, Orchards, Protected environments. Section 2: Pest profiles, Pest identification guide, Common pest species, Aphids and psyllids, Leaf hoppers, Mealybugs, Scale insects, Whitefly, Caterpillars (moths), Leaf miners, Spider mites, Thrips, Sciarids, Slugs and snails, Beetles, Vine weevils, Woodlice. Section 3: Beneficial profiles, Parasitic wasps, Predatory midges, Dance flies, Hoverflies, Predatory insects, Predatory lacewings, Predatory mites, Centipedes, Ladybirds, Ground beetles, Carabid beetles, Tiger beetles, Rove beetles, Earwigs, Spiders, Harvestmen. Section 4: Entomopathogens, Nematodes, Fungi, Bacteria, Viruses. Practical tips for gardeners, Index.